Hanvon formula recognition technology supports both online handwriting input recognition and OCR photo recognition. It simplifies the complicated formula input operation and provides strong technique support to the search and comparison of Internet education background. 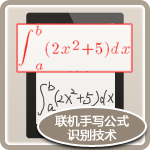 This product supports online handwriting recognition of complex mathematical expressions, including constant expression, variant expression, quadrature, radicals, second power, third power, complex fraction, matrix, summation etc. it uses integrated recognition method to output recognition results of mathematical expressions once. The product can recognize color picture or gray level picture in actual shootings and automatically analyze the structure of subject, then formula and text are output and recognized together, which is able to use for editing show or searching.